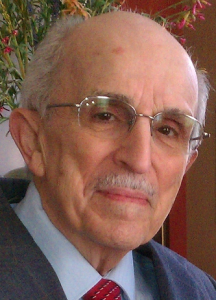 Salvatore Joseph Correnti, age 90, of Bourne, MA and formerly Garnet Valley, PA, died on January 31, 2019 at the Beth Israel Deaconess-Plymouth Hospital. He was the devoted husband of the late Elizabeth “Betty” Mary (Malfara) Correnti who predeceased him in 2017. Born in Philadelphia, PA on October 1, 1928, he was a son of the late Filippo and Angela (Follari) Correnti. He graduated from Southeast Catholic High School in Philadelphia and went on to attend Business College where he excelled in bookkeeping. He had worked for most of his life in the Printing Industry as an Offset and Lithographic Web Pressman for Havertown Printing. In 1988 he earned a Certificate of Achievement from the Graphic Arts Association. Mr. Correnti served his country proudly during the Korean War as he joined the US Army being honorably discharged in July 1953. He was a former member of St. Joseph’s Church in Collingdale and a member of St. John Fisher Catholic Church in Boothwyn, PA.
Salvatore had many diversified interests; He was an amateur Billiards Player, a Pinochle Player, and avid sports fan favoring the “Philly Sports”. He played pool with his dear friends at the Foxfield Clubhouse. At age 65 Salvatore learned to play the keyboard and enjoyed sharing his talents with his friends and family alike. Salvatore was the loving father of Deborah “Debbie” Matsinger and her husband “Jack” of Bourne, MA and Stephen “Steve” Correnti and his wife “Rubina” of Drexel Hill, PA. He was the cherished grandfather of John “JD” Matsinger, III, and Christopher Matsinger. He was predeceased by his siblings: Josephine Columbo, Mildred Whiteman, Paula Tyler and Charles Correnti. His funeral mass will be held on Saturday, February 16th at 10:30 am at ST. John Fisher Church 4225 Chichester Ave., Upper Chichester, PA 19061. Interment will follow in SS Peter & Paul Cemetery, Springfield, PA. Donations in his memory may be made to Malvern Retreat House, 315 S. Warren Ave., Malvern, PA 19355. I didn’t personally know him other than to share a hello and a peace shake on Sundays at Mass. I either sat in front of them or behind them at Mass every Sunday. And many times would see both he & his wife at breakfast in the local restaurant after Mass. May he rest in peace with his beloved wife. We will miss Uncle Sal but he is happy to be reunited with his beloved wife. We have enjoyed the times that we had together,the memories are cherished. Our thoughts and prayers are with Debbie and Stephen and their families. So very sad to lose Uncle Sal who is the last one of the siblings of that generation to pass. He was such a kind and gentle person and was always smiling. He is now together again with Aunt Betty. I will cherish the memories I have of the both of them. My thoughts and prayers to Debbie and Stephen and their families.